Well, Dartford got a reprieve from relegation and now find themselves back in the Premier division. Quite a challenge ahead, I think. After four matches, no wins, a draw or two but no goals to celebrate. Then, Bank Holiday Monday, 25 August 2014, we had an away trip to Barnet in North London. I wasn’t going to go, but decided against all logic that in the pouring rain it would be OK! Took half an hour to get from Princes Park to the tollbooths at the Dartford Tunnel, such was the queue of traffic. Took an hour to get to the A10 turnoff on the M25 and eventually got there about 2pm. Was able to collect the media pass much more easily than last year, when they made us traipse the length of the stadium, across a car park to a portacabin ticket office. Thank heavens they changed that. So far so good. Once pitchside, the rain continued relentless. My waterproof jacket and trousers were pressed into use for the first time since the end of last season. By the end of the match they were saturated and not really up to the job! 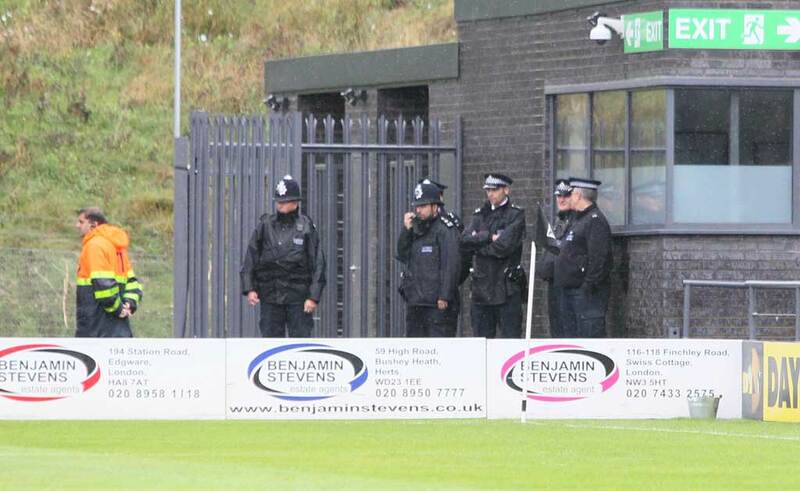 A lot of the ‘regular’ Dartford supporters boycotted the game after last year’s incidents, and I can’t say I blame them. The team did not travel on the coach, but made their own way there as a lot of the team live north of the Thames. Quite a few supporters made their own way, and the coach was not filled by any means. Barnet segregated the supporters, allocating the north stand behind the goal at one end, and a portion of the west stand with orange seats near the away supporters entrance, as last year. 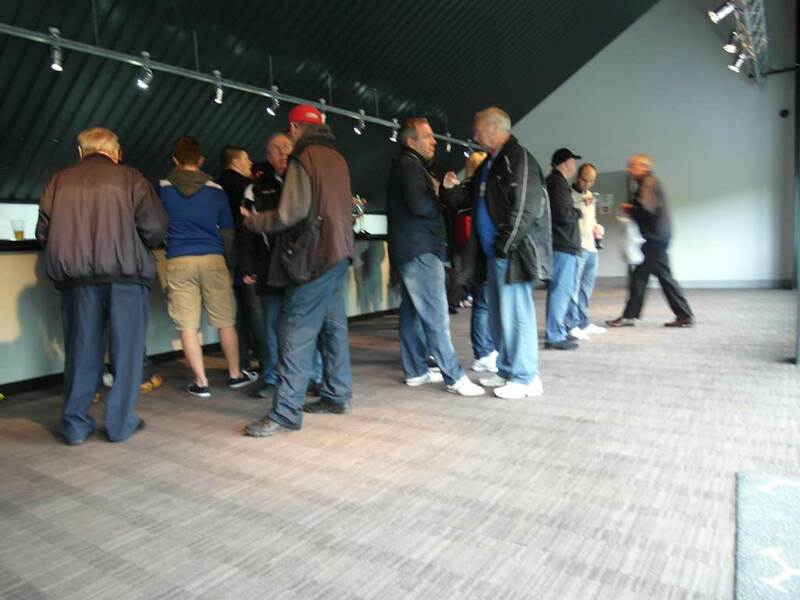 It was pouring with rain and most took shelter pre-match in the supporters bar. I am staggered that a place like Barnet can provide quite sumptuous facilities for the home supporters with tables, banquet chairs, hot food, bar etc but can only provide a cold, empty room with no seating at all. One lady told me she had to stand in the rain to queue at the entrance twice, as they gave her ‘stand’ tickets when she wanted ‘seated’ and even though the price is the same and the segregated areas are adjacent they insisted she stand in line in the rain just to swap the paper ticket! Barnet’s hospitality experience for away supporters. As an accredited photographer, with a highviz, portable seat and camera, its usually not difficult to find somewhere convenient to shoot the game from. Barnet make life difficult. Pitchside there is very little room between the barriers and the touchline, and I decided to shoot the first half from the other side for my own safety. Then, when I’d got fed up with being soaked, I decamped to the first few rows of the west stand and well out of the way of anyone, as the handfull of supporters were much higher up. Then I get told I can’t shoot from either of those places, only from ‘designated media positions’, either inside the pitch or under the stand behind the goal, or leave! Charming. Met up with another photographer who was under the shelter of the stand to avoid the rain and we had a right old moan about Barnet. He told me there were girls at the entrance selling tickets and they were reluctant to let him through to the club shop without buying a ticket! Not only that, but the staff in the club shop were incapable of directing him to the somewhat ‘hidden’ area just behind the shop through some double doors where he needed to get his media pass from and sent him on a wild goose chase before he finally find out where he should go. Having shot at Premier League grounds in the past, his view was Barnet were far more difficult and less welcoming. Towards the end of the game I spotted twelve stewards and seven police in the away supporters part of the stadium. I could only see three stewards in the rest of the ground. A bit overkill, given there were about 100 supporters. Still, I suppose Mr K has money aplenty. Pity he doesn’t spend a bit more on the visitor experience. Lighten up, Barnet, it is ONLY a game.